The King’s School and Tangara Girls School teachers were recognised by the Minister for Education at a World Teachers’ Day ceremony on Friday 26 October. The Teachers’ Guild of New South Wales hosted the 2018 World Teachers’ Day celebration to present awards for outstanding professional contributions to education made by a select group of teachers. The Teachers’ Guild NSW President, Dr Fred Osman said, “This event honors 57 worthy recipients across the different sectors and stages of education and acknowledges the achievements of all teachers in an increasingly complex, multicultural and technological society. The Teachers’ Guild NSW greatly admires the commitment of teachers in enhancing their professional knowledge, improving teaching practice, finding new ways to engage with students, and developing and fostering relationships with the wider community”, Dr Osman said. Ms Kathryn Fraser, Head of Enrichment and Extension at The King’s School is an experienced teacher and this year showed strong entrepreneurial leadership by enrolling her year 9 extension English and History students in a world first EduTech pilot program. Students used Bookform’s Information Communication Technology (ICT) & Artificial Intelligence (AI) software to collect aged care resident’s life stories and synthesis them into personalised memoir books. Ms Rita Sakr, Co-ordinator of Personalised Education at Tangara School for Girls, with over 20 years of teaching experience, has worked with students as a teacher, mentor and in community service. Rita is passionate about helping all students achieve their personal best and is a strong advocate of motivating students to learn not just in the classroom, but in the broader community too. This term Rita volunteered her own time, guiding 2 groups of year 9 and 10 students to participate in Bookform’s ‘Write of Passage’ pilot program at aged care, where students navigated new ICT & AI technology while maintaining polite and engaging conversations with elderly residents to collect stories of their past to craft a polished memoir book, that the resident and their families would cherish for many generations. Rita said, “Through the exchange of ideas and sharing of stories, it was beautiful to watch the students learn to value and admire the wisdom and life experience of the residents they worked closely with”. The benefits of intergenerational communication are well known, but by using this technology the teachers transformed a common community service activity into a creatively stimulating and productive activity for both their students and the residents. This challenged students to not only develop an empathetic personal connection with their elderly resident, but also develop their digital competency, life knowledge and self-confidence, all very important future-proofing skills. 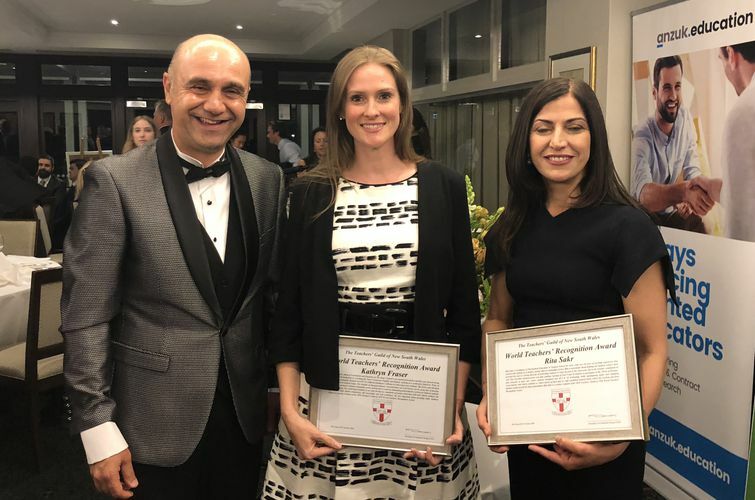 Both teachers were worthy recipients of the 2018 Teachers’ Guild of NSW World Teachers’ Recognition Award. Bookform scaffolds students to collect family and community life stories into print and digital books, for education, culture development and wellbing.